Will and I sing songs together in unison and play traditional tunes on melodeons and concertinas. Will is the closest thing we have to a genuine traditional musician - self taught and unable to read music, he learns everything by ear and has a unique style. One of England's national treasures. In January 2014, Will and I decided to abandon our singing together - a sort of conscious uncoupling! We will be making a one-off appearance singing together at the Bob Copper day at Cecil Sharp House on January 24th as part of the afternoon's Sussex Singers' Concert. A brand new band featuring Dan (melodeons), Martin Brinsford (harmonica and feet), Paul Burgess (fiddle), Ian Kearey (bass guitar) and Tim Normanton (banjo). We play a repertoire that is strictly French Canadian culled from recordings and transcripts of the old players, but played in a style for English ceilidhs. Available for bookings now!!! What started out as a solo album ended up as Duck Soup. Ian Kearey (on bass guitar, twelve string dobro and tiple) amd Adam Bushell (on marimba, musical saw, phonofiddle and mandolin) join me to play English and French Canadian traditional music, especially featuring the tunes of the late great Alfred Montmarquette.There's a generous helping of old songs too, some dating back to 1959 and earlier. Available for work - folk clubs, concerts, festivals, churches, bar mitzvahs. There are no new releases this week, so here's belated praise for a delightfully quirky album that came out a few weeks back. Duck Soup are a trio from the Brighton area who play what, at first, sound like English country dance tunes. 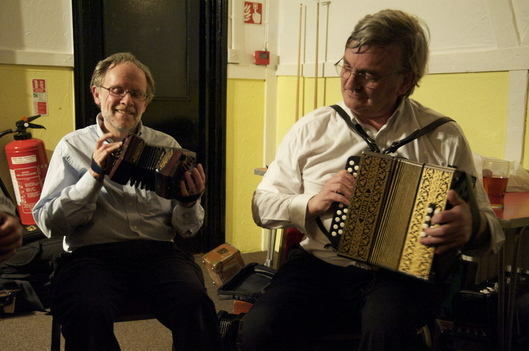 But they are given an unexpected new treatment, with unusual noises and influences matched against Dan Quinn's sturdy melodeon work and vocals. The band's bizarre lineup also includes dobro, mandolin, acoustic bass guitar and piano all played by Ian Kearey, once with Oysterband. There's also Adam Bushell, from the experimental music scene, who adds anything from the African marimba to phonofiddle and musical saw. Their repertoire includes traditional British songs, but their real hero is Alfred Montmarquette, a self-taught melodeon player who moved from New York to Montreal, made a series of recordings and radio appearances in the late 1920s and 30s, but died in poverty. Here, his "perilous waltzes" and marches are revived in the style of a traditional English band, alongside a bass-led treatment of the Aberdeenshire song The False Lover Won Back, or a sing-along treatment of The Bonny Bunch of Roses. Worth checking out. The second album by Dan Quinn, Ian Kearey and Adam Bushell is a splendidly ebullient affair, defiantly maverick and quirkily adventurous, while forging deeper roots with a joyously unselfconscious rural tradition. It’s fun – it’s delicious fun – especially seemingly for the band, who resonate resoundingly with country musicians of old, playing with smiles on their faces and a thousand tunes in their hearts for the pleasure of their local communities. There are no barriers either to the provenance of their repertoire or the instrumentation in which they choose to shape it. Adam Bushell’s musical saw stars on the opening waltzes Valse De Peril and Marche Du Mont Saint-Louis, originally recorded by Alfred Montmarquette (also a source for several other tunes on the album) in 1928, while Bushell’s marimba and Kearey’s Dobro add a further twist to Quinn’s driving melodeon on Indian Intermezzo – from the playing of the American John Kimmel – which sounds like it belongs in a slightly wonky fairground ride. A bizarre digitally recorded phono-fiddle effect leads the 18th century American country dance tune Mr Turner’s Academy Cotillion, while other instrumental delights include jaunty arrangements of an old Chieftains set dance and various French Canadian tunes, marimba at the ready. Duck Soup are irreverent but never disrespectful… and that’s before we even examine Dan Quinn’s informally unorthodox vocal excursions. In a style not dissimilar to Simon Ritchie, he tackles the Aberdeenshire ballad The False Lover Won Back, the Gypsy tale Young Morgan and the drinking song Little Brown Jug with the same rough nonchalance, occasionally teetering on disaster but invariably lifted by colourfully oddball arrangements. I’m not entirely sure their radical reinvention of Bonny Bunch Of Roses in music hall style works, but Ian Kearey’s 12-string Dobro around Young Morgan is inspired and, marimba on the march, Little Brown Jug is classic knees-up fodder. If anything can please granny, delight the neighbours, get the postman whistling and shut up the quiz teams in the local boozer, then this, surely, is that album. and finally here's an illuminating review from Neil Brookes in the magazine English Dance and Song - I am proud to capture the essence of traditional music more than many established folk acts! Here's an album that will make you smile, then maybe giggle a little at the singular mixture of instruments played by Dan Quinn (melodeons), Ian Kearey (mandolin, bass, piano, 12-string dobro) and Adam Bushell (marimba, mandolin, phonofiddle, musical saw) - not exactly conventional, and indeed there is plenty of joyful eccentricity, sometimes bordering on the weird. In many ways though, it captures the essence of traditional music far more successfully than many established folk acts, while at the same time managing to be supremely amusing and entertaining. 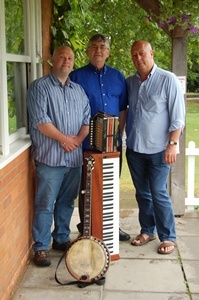 Dan's melodeon, particularly the one-row, is consistently masterful as he leads some nicely varied sets in an inimitable style that encourages Ian and Adam to explore some odd, but strangely compelling, accompaniment, often recalling the atmosphere of the fairground or music hall. Many tunes are from early twentieth century recordings of accordionist Alfred Montmarquette, and from the repertoires of John Kimmel, Henri Lacroix and Alexander Prince. Mr Quinn also sings a number of fine traditional songs from sources closer to home in a plain but effective way. 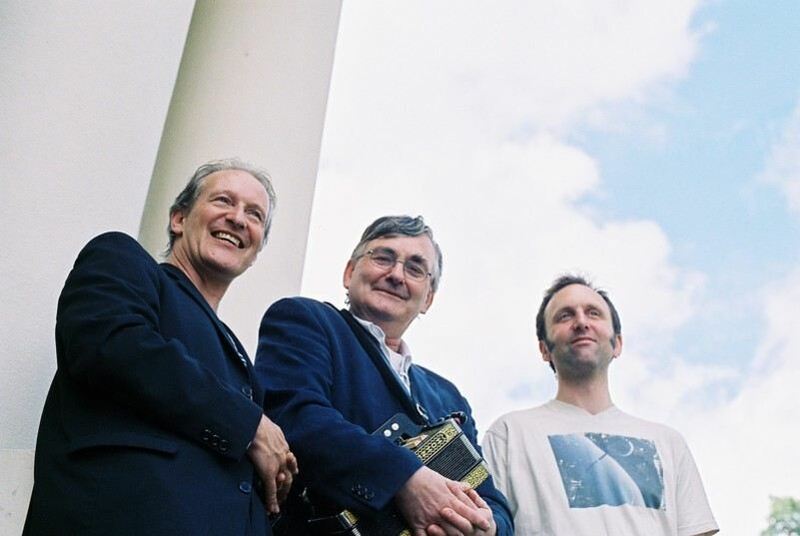 "The False Lover Won Back" and "Young Morgan" are both terrific versions from Martin Carthy. A jaunty "The Bonny Bunch of Roses" contrasts cleverly with its weighty, historical narrative, and amusingly requires some ingenious work to fit the music to the words. Walter Bulwer, Oscar Woods and also the Quebecois masters often had a similar flexibility in their music, and contrary to logic the song works splendidly in the same way. This album offers succour to any poor soul who mourns the lack of originality in much of the music of today, and as the delicious finale "Valse Pompadour" ends with plaintive solo phonofiddle notes that echo a crooning Mr Punch, one is reminded of his very apt catchphrase - that's the way to do it! For your dancing pleasure - the perfect ceilidh band - and what a pleasure it is to take the stage with these two great exponents of English dance music! Rob Murch is one of England's greatest players of the classical banjo and plays a Clifford Essex Paragon banjo. As well as playing in The Watch, he remains an integral part of Devon's Dartmoor Pixie Band. Gareth Kiddier is a second-to-none rock solid piano accompanist renowned for his playing in The Bismarcks and the current and wonderful Polkaworks. We play traditional tunes from England and Quebec and try to include a smattering of Rob's speciality banjo pieces. Book now!! 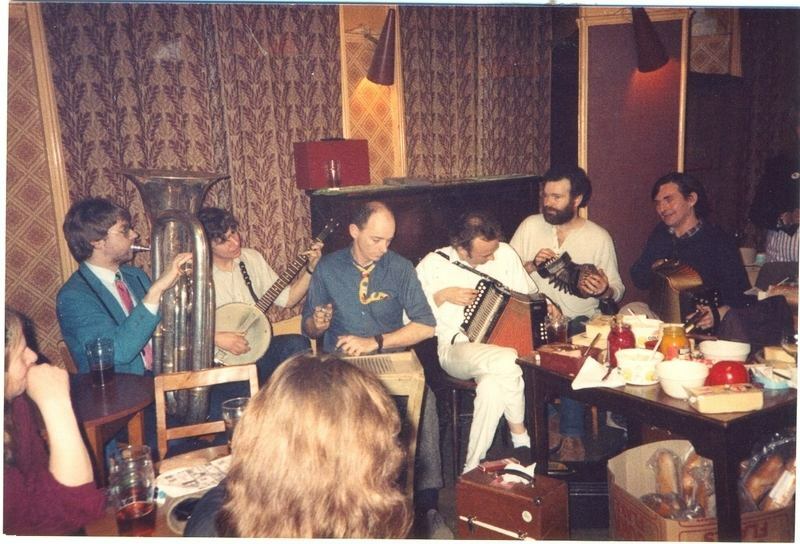 Here is a charming picture of the band in action at the Empress of Russia, Islington in 1984, when we all still looked young and vaguely presentable! I suspect this was the last gig. I'm the one on the right. I left the glorious and (again) seminal Gas Mark 5 in 1989 to spend more time with my family. 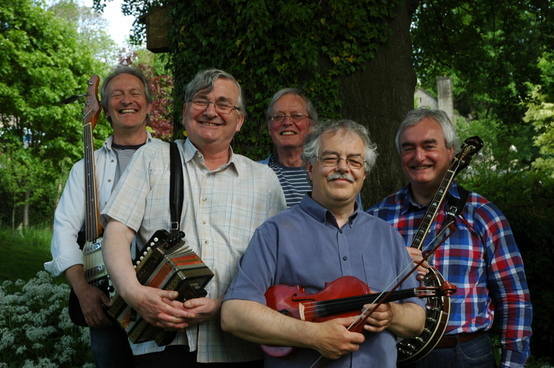 This first line up of the band was revived for a ceilidh at Towersey Folk Festival in 2013 and at Sidmouth Festival in 2014. Terry Mann: Bass trombone, keyboard.